After my scheduling flub of introducing the boys to Winslow Homer before we had finished with the French Impressionists, we whizzed back to Europe with our History of Art project and turned our attention to Renoir. Renoir was one of the first artists who really captured my interest and imagination. I remember the thrill of being allowed to borrow a book of his art work from the grown up section of my local library and then poring over the full colour illustrations. I have owned a hefty book about Renoir for over a quarter of a century so that seemed like a good place to start. 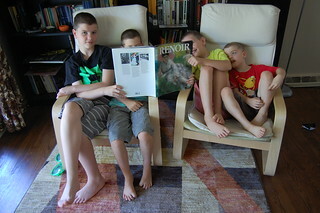 I showed the boys a few of my favourite Renoir paintings and then they looked through the book and told me which paintings they were drawn to and why. When it came time to create something inspired by Renoir, three of the wee horrors insisted on working in coloured pencil. Again. I am definitely setting myself the personal challenge of getting them to explore a wider variety of media by the end of this project. The most persistent offendor in the “stuck in a pencil rut” brigade is my 9 year old. 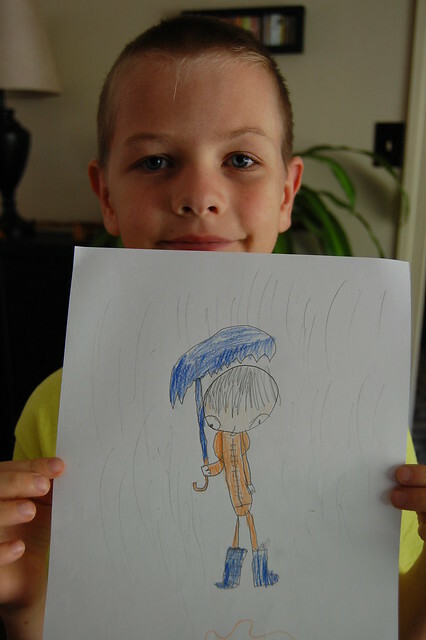 He was inspired by the painting ‘The Umbrellas’ and drew a little figure sheltering from the rain. I like the way he has drawn the downcast face. I note he has used the same colour palette as he did for the Winslow Homer lesson. I don’t readily associate Renoir with still life – though perhaps that is because I am drawn to figurative art work more – but it was a still life that caught my 8 year old’s attention. 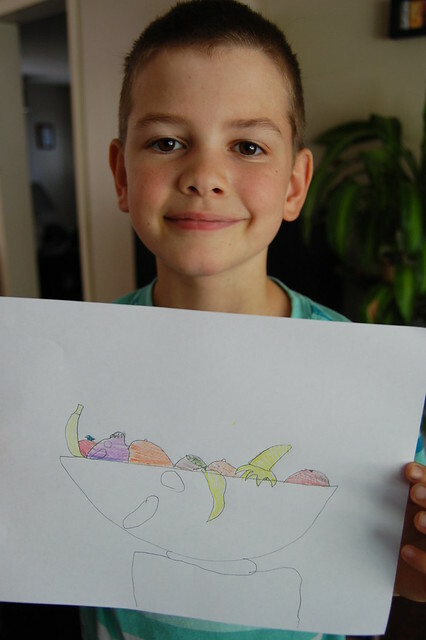 He drew a fruit bowl. Minimalist much? You know with my 12 year old it is either going to be Minecraft or penguins by now. Today it was Minecraft. Inspired by various Renoir paintings depicting couples dancing, he drew two Minecraft characters engaged in a jig. I think it is rather charming and at least he is working in a themed series I suppose. My 6 year old is definitely emerging as the one most likely to try something different or approach the lesson from a different angle. Rather than being inspired by a particular painting or even subject, my youngest was intrigued by the soft blending and brush strokes evident in so many Renoir paintings. 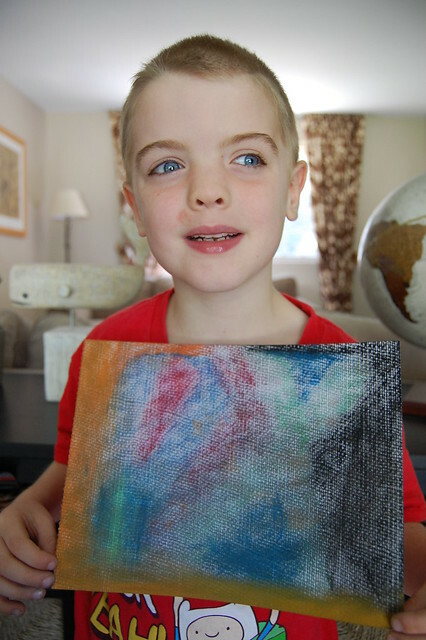 He, therefore, used some chalk pastels to blend his own soft colours. I just managed to stop him adding and smudging more colours before he made mud – though that would have been a lesson learned too. I too took my inspiration from ‘The Umbrellas’ which has always been one of my favourite Renoir paintings. I decided to work on an ink drawing of a little figure in the rain. I kept it quite child-like and whimsical as that was the creative mood I was in. 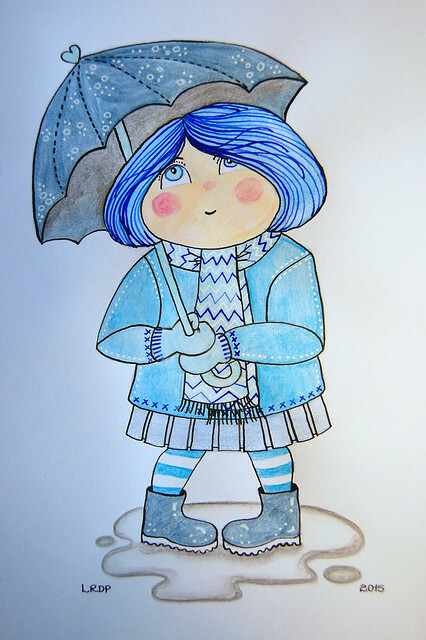 An umbrella also features in today’s Crazy Critter painting. I am at #88 in the series. Getting there! I like your 9 year old’s drawing! Thank you. I will pass your praise on to him. Weirdly, his drawing makes me think of ‘Blade Runner’. No bad thing I suppose. I visited the Musee D’Orsay as an impressionable 19 year-old and fell in love with Renoir, particularly his dancing couples. Everyone’s work were all beautiful though the dancing minecraft couple made my day. Thanks for sharing! 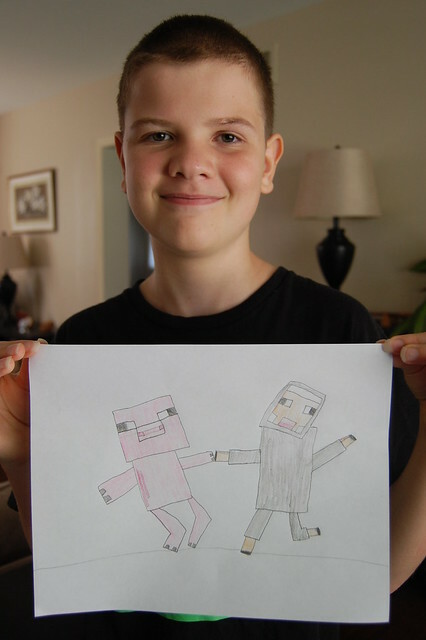 I think that is his best Minecraft drawing so far.